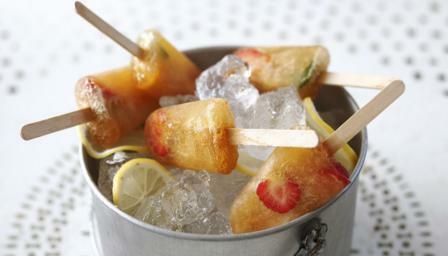 Serve these naughty Pimms lollies instead of dessert at a summer barbecue. Equipment: for this recipe you will need wooden lolly sticks and lolly moulds. Mix the Pimms and lemonade together in a large jug. Place a couple of strawberry halves, a few mint leaves and a little orange zest into each lolly mould. Pour the Pimm mixture into each ice lolly mould until three-quarters full. Insert the lolly stick and lid and freeze for 2-3 hours, or until frozen solid. Alternatively, you can use large shot glasses as moulds: place the strawberry, mint and orange zest into the glass and fill with the Pimms mixture. Freeze for one hour, or until the lollies are partially frozen, then insert the lolly sticks and continue to freeze until completely frozen. To remove the lollies, dip the moulds briefly in hot water and carefully remove the lollies.